Vincent J. Fenerty Jr. stepped down as executive director of the Philadelphia Parking Authority in September 2016. He had remained in his role after admitting sexually harassing a coworker in 2015. Calling the board of directors of the Philadelphia Parking Authority "absentee landlords" and former Executive Director Vincent J. Fenerty Jr. a "tyrant," Pennsylvania Auditor General Eugene DePasquale said Thursday that the state should return control of the authority to the city. DePasquale, in announcing the findings of two lengthy audits of the authority, said Fenerty should have been fired in 2015 after he admitted to sexually harassing a coworker. Instead, DePasquale said, Fenerty was allowed to continue to work with unchecked control of the agency. "It is the executive director and board of directors who bear the responsibility to ensure that employees have a safe workplace and the authority is run efficiently and effectively for the people of Philadelphia," DePasquale said at a news conference in City Hall. "My audit showed that both the former executive director and board failed on both counts." Fenerty could not be reached for comment. The reports released Thursday had looked at the authority's employment policies, including those concerning sexual harassment and discrimination, and fiscal operations, particularly whether the appropriate revenue was sent to the School District of Philadelphia. The audits concluded that Fenerty had free range to hire who he wanted, manipulate records, and use the PPA's funds to pay for lavish expenses. Through his actions and decisions, the authority shortchanged the School District by $322,232, according to one audit. In addition, $76.8 million in uncollected parking fines since 2012 is money that the auditor general says could have gone to the School District. DePasquale chided the board for allowing Fenerty to keep his job after his confession to a June 2015 complaint of sexual harassment against him. The board of directors said Fenerty could keep his job as long as he didn't kiss, caress, hug, massage, or engage in personal physical conduct with other authority employees or have conversations with employees that were sexual in nature. "That's what he did," DePasquale said, describing Fenerty's behavior. "They didn't just make that up from thin air. They put that language in there because that's what he did. And he didn't get fired." An audit found that Fenerty manipulated records to improperly pay himself more than $2,000 for unpaid leave and make similar improper payments to other senior managers. DePasquale suggested that in doing so, Fenerty may have violated the state's Public Official and Employee Ethics Act. He said he would refer the case to the IRS, the state Attorney General's Office, and the State Ethics Commission. Attorney General Josh Shapiro said in a statement that his office "will carefully review these serious allegations of misconduct with all speed and diligence to determine if any criminal violations occurred." In a letter to PPA Chairman Joe Ashdale last month providing an advanced look at the audits and their findings, DePasquale accused the board of failing "to establish an ethical culture within the organization." The audits make 117 recommendations for improvements at the PPA. Ashdale said that most recommendations already have been or are in the process of being implemented. Ashdale blamed Fenerty for any shortcomings at the authority, saying that the former executive director "controlled the flow of information" to the board and left other employees fearful of retaliation if they brought up concerns. Through a spokesman, Ashdale declined to comment Thursday on the audits. Fenerty resigned in September 2016 amid two sexual-harassment scandals. 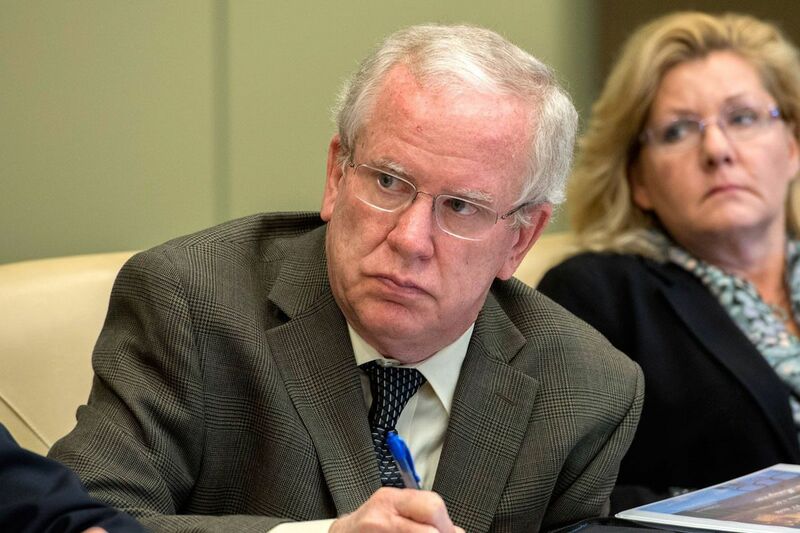 Inquirer columnist Mike Newall first reported last year that Fenerty had paid $30,000 in 2015 for an investigation into his sexual harassment of Sue Cornell, a top executive at the PPA. A week later, Newall reported that in 2007, the PPA had offered another woman $150,000 after she accused Fenerty of sexually harassing her for three years. She declined the settlement. Fenerty, who was paid $223,000 a year to run the PPA, receives a $158,628 yearly pension, the highest in the city's retirement system. In January, the Inquirer and Daily News reported that Fenerty had pocketed $227,238 for nearly 2,000 hours of unused vacation, administrative leave, comp time, and sick leave accumulated over 33 years. The auditor general's report noted that Fenerty doled out raises of about 19 percent over a 28-month period to 30 senior-level managers. The report called those raises "excessive." In the report, DePasquale said that the authority's mismanagement had resulted in less money going to the School District over the years. Under the current state-mandated formula, the authority sends the city the first $35 million it raises beyond the cost of running its on-street parking operation. Whatever is raised beyond that goes to the School District. That payment has hovered around $10 million annually in the last few years. Auditors found that since 1990, the PPA has failed to collect more than $580 million in outstanding parking tickets and associated fees. Of that figure, $108 million was uncollected between 2012 and 2017. Auditors calculated that $76.8 million would have been the School District's share of money from currently uncollected parking tickets and fees. Auditors also found other examples in which the School District was shortchanged. "PPA had policies in place… that allowed for excessive salary increases, leave balances, and tuition reimbursement, totaling $814,409, which negatively impacted the payment amount to the School District," the audits says. The audit criticized the authority's tuition-reimbursement plan as too lenient and not in compliance with the authority's own policy. For example, one employee was reimbursed $16,316 for courses the employee took as a culinary arts major, which goes against the agency's policy that tuition must be related to PPA work. Then there was $7,600 spent on $25 gift cards for employees as a way to boost morale. In addition, the authority spent $2,800 on five charity golf outings for some senior managers. PPA checks were also cut for local union dances and celebrations for community organizations. The authority sponsored a softball team, gave $500 to a local theater, and $500 to a church at the request of Ashdale. "PPA is a government agency, not a privately run firm," the audit said. "Management should be much more prudent … since every dollar spent on luncheons and donations to local organizations equates less money for the School District to spend on children in the district." On Thursday, City Council passed a resolution calling on the mayor, legislature, and governor to take steps to return the authority to city control. All members voted in support of the resolution except Brian J. O'Neill, who voted no, and Councilman Al Taubenberger, a PPA board member, who abstained. Both are Republicans. Gov. Wolf issued a statement late Thursday also calling for abolishing state control of the authority. "The findings of the auditor general's audit are disturbing and display a culture that runs afoul of good government and basic decency," Wolf said. "I urge the General Assembly to swiftly abolish state control of the authority and return the functions of the PPA to the citizens and local government of Philadelphia."